29 March 2011: There have recently been some cases of interference to Amateur satellites from EchoLink nodes operating in the satellite sub-band from 145.800 - 146.000 MHz. When setting up a node on 2 meters, please avoid this frequency range. 27 March 2011: A new book, "Nifty E-Z Guide to EchoLink Operation", is now available. In eleven chapters, this book covers many of the details of setup, configuration, and operation of an EchoLink node. The book is available from niftyaccessories.com. 11 May 2010: EchoLink will be on hand for Hamvention 2010 in Dayton, Ohio, May 14-16. Stop by Booth # 570 for a free EchoLink callsign badge, and to choose among several "show special" Vanity Node Numbers that will be made available only to Hamvention attendees. 4 February 2010: An edition of EchoLink for the Apple iPhone and iPod touch is now available free of charge at the App Store. 6 January 2010: Some of the EchoLink servers are now being hosted in the Amazon Elastic Compute Cloud (EC2). Moving more servers into the "cloud" is under consideration. 1 September 2007: The EchoLink system now has features that make it more "firewall-friendly", when used with Version 2.0 or above. This is particularly useful for users who are operating at Internet hot-spots, or who have certain types of satellite or wireless Internet service. For details, see EchoLink, Routers, and Firewalls. 25 February 2007: Version 2.0.902 of the EchoLink software is now available. Along with a number of bug fixes, this version makes it easier to use an EchoLink Proxy, and includes a built-in firewall tester and sound-card calibrator. There are also several changes to ensure smooth operation on Windows Vista, and an updated installer. This is a recommended upgrade for all EchoLink users. 17 February 2007: The online Help files are now available in Brazilian Portugese. Choose Help Files, then choose BR-Portugese from the drop-down list of languages. Thanks to Luzemário, PT2LDR, for the translation. 16 February 2007: A new version of the EchoLink Proxy software is available (1.2.3). This version fixes an intermittent disconnect problem, improves the behavior of the accept/deny patterns, and provides new options for multi-homed servers. It also corrects a threading problem discovered in version 1.2.1, and a socket problem in 1.2.2. This is a recommended upgrade for those who run an EchoLink Proxy server. 15 December 2006: The FCC is now allowing auxiliary stations to operate in portions of the 2-meter band. In addition to the original allocations on 222 MHz and UHF, the new rules allow auxiliary stations in the U.S. to transmit in any part of the 2-meter band, with the exceptions of 144.0-144.5 MHz and 145.8-146.0 MHz. 21 March 2006: A Telephone authentication option is now available for U.S. hams. By placing a call from your listed home telephone number to a special automated system, and receiving a confirmation call in return, you can validate your callsign for EchoLink (or receive a password reminder). See the Validation section for details. 8 March 2006: Positive proof of license and identity is now required for all new EchoLink users, without exception. This milestone makes EchoLink unique among Amateur Radio VoIP systems, and underscores a focus on security that has been a vital part of the project since its inception in 2002. Since that time, we have been gradually increasing the percentage of new users from whom proof of identity is required, and have now reached 100%. 1 March 2006: A new Validation section has been added to the EchoLink Web site. This is a full-service area that offers new users several different online options to request access to the EchoLink system. Among the new options, U.S. hams can now ask that a postcard with a registration code be sent to their FCC-registered mailing address, as an alternative to submitting a license copy. The Validation section also includes self-service tools for handling callsign changes, node-number swaps, and password reminders. 11 January 2006: The Link Status page now offers an option to view the location of all active EchoLink nodes using the Google Earth software. Google Earth is an interactive desktop application that displays detailed views of the planet based on satellite imagery and other data sources. If your -L/-R node doesn't yet appear on the Link Status page, be sure to enter the lat/lon information in the EchoLink software on the RF Info tab of under Tools->Sysop Settings. 5 January 2006: K1RFD will be conducting a forum on EchoLink and VoIP at Ham Radio University 2006 in Bethpage, NY, on Sunday, January 8. Please see the Ham Radio University Web site for more information. 24 October 2005: Version 1.9.892 of the software is now available. This is a only a minor update to support new callsigns with four-letter suffixes. There are no other functional changes, and no need for existing users to upgrade. 21 December 2004: K1RFD will be conducting a forum on EchoLink and VoIP at Ham Radio University 2005 in Bethpage, NY, on Sunday, January 9. Please see the Ham Radio University Web site for more information. 21 September 2004: K1RFD will be doing a presentation on EchoLink and VoIP to the Greater Norwalk (CT) Amateur Radio Club on Wednesday evening, October 13. All in the area are welcome to attend. 30 August 2004: K1RFD will be doing a presentation on EchoLink and VoIP to the Long Island (NY) Mobile Amateur Radio Club on Wednesday evening, September 8. All in the area are welcome to attend. 20 May 2004:Version 1.9 of the software is now available, along with EchoLink Proxy . 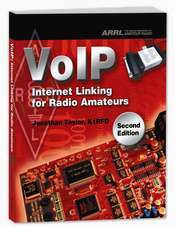 7 April 2004: The ARRL has published a new book entitled VoIP: Internet Linking for Radio Amateurs. 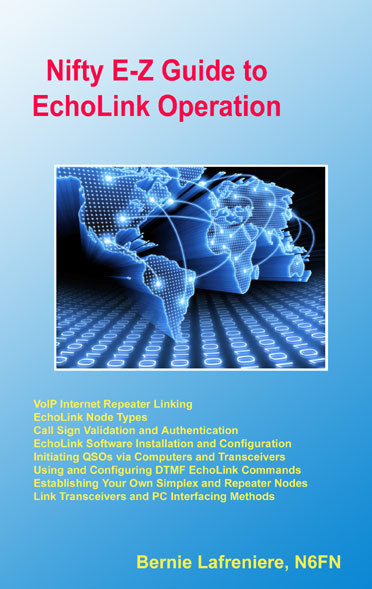 The book discusses Amateur linking systems such as EchoLink and IRLP. You can visit the ARRL Web site to order a copy. The book will also be available at the ARRL booth at the Dayton Hamvention, May 14-16. A portion of the author's proceeds from sales of the book will help cover the costs of operating the EchoLink system. 31 January 2004: Version 1.8.874 of the software is now available. 5 November 2003: Vanity Node Numbers in the range 144000 to 148000 are now available. The available numbers have been chosen to correspond with standard simplex and repeater frequencies in the 2-meter band. See Vanity Node Numbers for more information. 28 September 2003: If you have signed up for the ARRL's Logbook of the World program, you can now use your Trusted QSL digital certificate to authenticate yourself as a new EchoLink user. If you are asked to provide proof of license during the validation process, a digitally-signed request can be used instead of sending us a photocopy of your license. A special utility has been created for this purpose. For details, see Authentication. Also see the news release. 8 August 2003: Version 1.7.863 of the software is now available. See Latest Features for more information. 28 May 2003: To help defray the costs of hardware, software, and Internet access required to keep EchoLink running, I'm pleased to offer a Vanity Node Number program. This is an opportunity to swap your existing, sequentially-assigned node number with a 4- or 5-digit number of your choice. See Vanity Node Numbers for details. 14 May 2003: Users logging in with versions prior to 1.6 may see a reminder about a software upgrade. Support for versions prior to 1.5 has been withdrawn, and these versions will no longer work with the addressing servers. New callsign validations now require version 1.6.848 or above. If you are using a version of EchoLink downloaded before December 11, 2002, please upgrade to the latest version. 6 May 2003: EchoLink was introduced May 15, 2002. On the occasion of its first birthday, I would like to acknowledge the efforts of the "unsung heroes", the validation and support volunteers who work behind the scenes to keep the system running each day. This group manually reviews and processes about 275 new callsign validation requests each day (including dozens of license photocopies), and receives and responds to about 100 e-mail support questions daily. Bernie, W1CDM and Terry, VK2JTP handle the lion's share of the daily callsign validation and e-mail support. Jim, WB2REM, Paolo, I1HJP, Nobby, G0OPD, Bill, G4VYX, and Ted, KE4TTE round out the callsign validation team. In the past year, this illustrious group has deftly processed nearly 100,000 validation requests, to help make EchoLink one of the most widely-used Amateur Radio software applications of all time. 18 April 2003: Added Repeater Linking Tips page. 18 Mar 2003: Version 1.6.848 of the software has been released. See below for details. 10 Feb 2003: After February 14, 2003, versions of EchoLink prior to 1.3 will no longer be supported by the addressing servers. If you are using a version of EchoLink downloaded before October 22, 2002, please upgrade to the latest version. 27 Jan 2003: After January 31, 2003, the EchoLink addressing servers will no longer allow logins from versions of theBridge software prior to 0.46, because of a bug which can affect the performance of the addressing servers. If you are running a conference server using a version of theBridge which is earlier than 0.46, please download and install the latest release, then contact EchoLink Support to indicate that it has been upgraded. 18 Dec 2002: Users logging in with versions prior to 1.3 will see a reminder about a software upgrade. Support for versions prior to 1.3 may soon be withdrawn. New callsign validations now require version 1.5.832 or above. 17 Dec 2002: The *ECHOTEST* conference server is now available. This server simply records and plays back your audio transmissions, for testing purposes. The node number is 9999. Thanks to WB6YMH. Fixed problems with displaying Asian characters in Chat window and Station List. Fixed intermittent page-refresh problem with Web remote control feature (in Sysop mode). Drop-down box to select public proxy; new Proxy and Performance tabs. Proxy can be changed without requiring re-start. Sound card fine-tuning control with self-calibrate option. Built-in Firewall Test utility (similar to Troubleshooter). Added DTMFDigit event to API. Opening wave device at startup so it shows up on Vista volume panel. Moved text and WAV files to My Documents area instead of install directory. Added more COM ports to drop-down lists (COM9-COM16). Added support for callsigns with four-character suffixes. Minor fixes to countries/continents in Explorer view. Added reminder message to Link Setup Wizard. Support for EchoLink Proxy software; please see EchoLink Proxy for details. Bug fix for: When the Dial-In remote control feature is enabled, the System log will show "Control operator disconnected" even if the line rings without having been answered by EchoLink. Bug fix for: Stations in Moldova are listed under Asia instead of Europe. Bug fix for: If Conferences is un-checked on the Security tab, incoming connections from conferences with callsigns ending in -L or -R are not properly blocked. Bug fix for: In Explorer View, the width of the Station column is incorrect on high-resolution displays that have Large fonts enabled in the Windows display settings. Text in the Chat window can now be selected and then Deleted from the Edit menu. Fixes to certain event functions in the EchoLink API (LinkStatusChange, DTMFString). Dial-in remote access is available in Sysop mode. This uses the PC's "voice modem", if present, and allows the link to be remotely controlled over a telephone line, similar to many repeater controllers. Option to not store the password (i.e., be prompted for it each time EchoLink starts). Microphone type setting on Audio tab (single-user mode only). When set to "General-purpose" mic, applies an internal midrange/high boost to simulate the response of communication-type mics, for better intelligibility. Option to suppress icons in pull-down menus (for screen readers). Added several new methods and properties to API. Improved logic for activity reminder tone to make it play less frequently. Voice announces "access denied" instead of "unavailable" if connect attempt is rejected due to peer's security settings. Added country folders for Netherlands Antilles, East Timor, and Hong Kong. Moved Philippines, Brunei, and Indonesia from Asia to Oceania folder. Displaying "[Not in QSO]" instead of "Not connected" when idle. Bug fix for: Alarm lists and callsign accept/deny lists are not managed correctly when switching from one Profile to another. Bug fix for: Un-checking Conferences on the Security tab does not always prevent outbound connections to EchoLink conferences, even if the Outbound option is checked. Un-checking Users incorrectly blocks outbound connections to conference servers. Bug fix for: When using the serial port for carrier detect (rather than VOX), a station that connects to your link will hear no audio if a QSO is already in progress on the link frequency, until the next time the COS signal is dropped. This can cause QRM if the remote user transmits. Bug fix for: On some versions of Windows, when using an external script that receives EchoLink Automation events, EchoLink does not shut down completely when closed. Bug fix for: Scroll bars in the Station List are not managed correctly when the Station List is re-sized smaller than the default size. This is also evident on 640x480 displays, or 800x600 displays using a large system font. Bug fix for: In Sysop mode, setting Connect and Disconnect signals to "none" also suppresses signals for outbound connections (initiated with DTMF commands). Bug fix for: The IsPeerConnected function in the API does not work correctly. Bug fix for: On Web remote control page (Sysop mode), the Refresh link does not always refresh the page. Bug fix for: If a Morse ID coincides with the end of RX, the Morse ID is sometimes truncated. Bug fix for: Number in parentheses after Location does not appear if connected to a conference, even if conferencing and multi-conferencing are enabled. Bug fix for: PTT control via CTS pin (for local mic in Sysop mode) does not always work correctly. Bug fix for: ID type parameter in SendID API call is ignored. Bug fix for: Misleading error message if PlayWaveFile API method called with bad filename. Bug fix for: Stations from Fiji appear in Swaziland folder. Bug fix for: When connected to a conference, numeral in parentheses does not appear in Location field. Bug fix for: "Error message when adding Alarms while not logged on"
Bug fix for: "Defer or Mute Announcements not working with COS RX control"
Bug fix for: "Active COS state not recognized when PTT releases"
Bug fix for: "VOX Delay spin buttons do not have correct range"
Bug fix for: "Welcome message not always heard by connecting station"
Bug fix for: "Activity reminder played after remote station's over"
Bug fix for: "Reverse DNS lookup can fail on certain ISPs with Windows XP"
Separate DTMF commands for "disconnect" and "disconnect all"
Fixed problems with signals in Sysop mode on some machines, which had affected Connecting signal and courtesy tone (among others). Showing correct grid square for stations near 1 degree West. EchoLink now stores log files, favorite.txt, info.txt, and recorded WAV files in a folder under My Documents called EchoLink, instead of the installation directory. When you upgrade from an older version, EchoLink automatically moves these files and updates the configuration accordingly the first time it is run. However, if you have configured custom Signals that are stored in the wav/ folder, you will need to update your configuration to point to their new locations. (Files stored in other locations are unaffected). Beginning with version 2.0.902, be sure that your DTMF Shortcuts list includes the full callsign of the station; for example, you must have W1XYZ-L rather than W1XYZ when you wish to connect to W1XYZ-L. If you can see the list of stations, but are having difficulty connecting to other stations on EchoLink, please read the section Firewall Solutions. Stations which have just come online, or have just changed status, are highlighted in yellow in Index View. Some older Windows 95 machines may not have Winsock 2 installed. If you get a message about WS2_32.DLL missing when you try to run EchoLink, please download and install the Winsock 2 update for Windows 95 from Microsoft here. You may also need to upgrade certain system components by installing a recent version of Internet Explorer. In Sysop mode, although serial ports COM1 through COM16 are listed, only COM1 through COM9 are actually usable; the program does not work with COM10 through COM16. In the EchoLink API, the Alarm event never fires. In the list of input and output audio devices on the Audio tab, when running on Windows Vista or above, the devices are sometimes mis-labeled. If you want to select a specific audio device and the selected device doesn't seem to be working, try choosing a different device in the list.